I have some spare time to work with csDoom now. Please help and report bugs in the new binaries and code I have released. I read all bug reports. Not played csDoom before? You'll want this package (Win32) to get right into the action (this contains the shareware wad, so you can only play on the shareware servers, unless you have original doom/doom2/final wads)! Most people know that DOOM was written by id Software. This project is not supported by them. 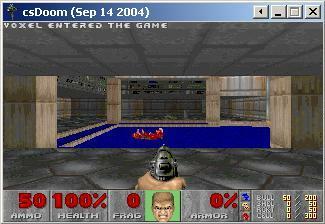 csDoom (Client/Server Doom) was written by Sergey A. Makovkin, aka Fly. It was later abandoned, partially due to the immature behaviour of people. There was much potential. The code, however, was buggy. Egos were bloated. Exploits were found and used. IRC channels were taken over. Wish I was there type of stuff. I discovered csDoom much later than these events happened. Noting the crashy code, immediately I set about patching my own client. Having reported several security problems to NightFang, who was rarely around, I did not get much of a responce or any acknowledgement from him. Reading old logs and post-mortems, I have serious doubts about whether he was one of the good guys, or the bad. Have never been able to find or contact Fly (update: I have seen and briefly talked to Fly online very recently for a couple of minutes. He is alive and well, and also thinks the bugs should be patched). His site lies deserted, empty. The binaries and sources on that site are old and I have lost count of the problems inherent in his last release. However, the game works. I have now set out to fix and improve the game. However, I do not intend to make any major changes. To get more people to experience DOOM!